The 1956 Suez War has long been seen as a conflict between Israel and Egypt, with Israel responding to Egyptian “provocations” and guerilla raids by invading the Sinai Peninsula on October 29, 1956. Following Israeli tactical successes against the Egyptian Army, armed intervention by France and Great Britain was necessary to guarantee international access to the Suez Canal, leading to the first use of a threat to use strategic nuclear missiles by Nikita Khrushchev, resulting in the withdrawal of Anglo-French forces from the Suez Canal Zone and Israeli military forces from the Sinai. As with much of “history,” this account does include actual events, but not in the proper context. The real Sinai War was planned by Britain and France, with the cooperation of Israel, in order to expel Egyptian forces from the Suez Canal following its nationalization the year previously by the government of Gamal Abdel Nasser, in hopes that this war would lead to Nasser’s fall. Instead, it led to the fall of British Prime Minister Anthony Eden, and is considered the “last gasp” of European imperialism in response to the anti-colonialist movements in the period after the Second World War. For the Israelis, who really did wish to attack the Egyptians in response to numerous violations of the 1949 cease-fire, it was an opportunity to curry favor with major European governments, which could lead to a lessening of the isolation of Israel following the 1948 War of Independence. The Israeli armed forces clearly demonstrated tactical, strategic and technical superiority to the Egyptians in their thorough defeat of the Egyptian Army in Sinai. This led to the ten quietest years in the history of modern Israel, ended by the 1967 Six-Day War. Israeli military thinking during the early years of the nation was open to daring “out of the box” thinking, due to the fact Israel was outnumbered and faced opponents who were better-armed following Nasser’s deal with the Soviet Union for the supply of modern Soviet military equipment. One of the most daring missions ever carried out by any unit was the “wire busting” mission flown by the P-51D Mustangs of 116 "Ha'Kanaf Ha'Meofeef" (The Flying Wing) Squadron of the Heyl Ha-Avir on October 29, 1956. 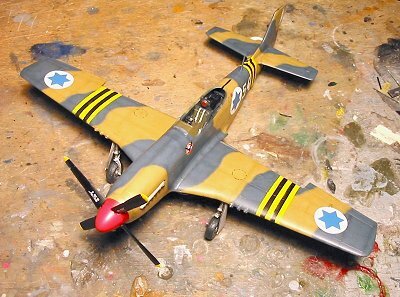 Israel had obtained P-51D Mustangs from Sweden following their retirement from Flygvapnet in 1952, though at least two Mustangs had been obtained during the 1948 war from U.S. surplus stocks in Europe and were used in the closing stages of that war in 1949. Many of these Mustangs were veterans of World War II combat with the U.S. Eighth Air Force, inasmuch as the Swedes had purchased them direct from post-war airfields in 1946 as U.S. units were disbanded and returned home. The Mustangs supplemented Spitfires that had been obtained during the 1948 War. By 1956, Heyl Ha-Avir had obtained Ouragan and Meteor jet fighters and was beginning to equip with the Dassault Mystere IVA. The Mustangs were considered obsolete and placed in storage that Spring as units re-equipped with the more modern jets, with 105 Squadron becoming the OTU for P-51s and the only regular unit still using the aircraft. 116 Reserve squadron was formed at Ekron (Tel Nof) in February 1956, manned by flying instructors from the flight school there, when 101 Squadron relinquished their P-51D Mustangs to re-equip with the first Mystere IVA aircraft. 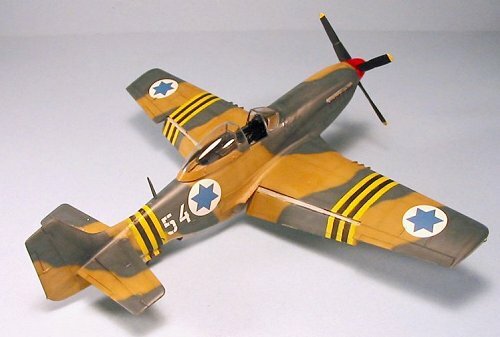 The newly-transferred P-51s were given a new camouflage paint scheme, in contrast to the natural metal finish in which they had served since their arrival in Israel. Some of the ex-101 Squadron aircraft retained the red/white rudder stripes of their original operator. Given that the experience level of the 116 Squadron pilots was high, the unit was chosen to carry out a difficult and very dangerous mission, to attack Egyptian communications in the Sinai peninsula upon the outbreak of hostilities. The low-level mission would involve the aircraft having a 100-foot metal cable attached to the rear fuselage, in order to tear down the above-ground telephone wires by which the Egyptians communicated. If an aircraft managed to wrap its dragged cable around a telephone pole, or get it tangled in phone lines, the result would be a crash under conditions where the pilot would have little chance of surviving impact with the ground. Even more daunting, the mission would begin in darkness. The mission, the first combat action of the war, was completely successful, with all aircraft returning to base. Egyptian battlefield communications nearly ceased as a result, which led directly to the success of the Israeli armored units against the Egyptians, resulting in the Israeli forces overrunning the Sinai in less than 72 hours of combat. Although the airplanes were obsolescent in the face of Egyptian MiGs and Meteors, the P-51s fought with distinction throughout the campaign, providing intensive ground attack operations in direct support of the ground forces. Of the 29 aircraft available in 105 and 116 Squadrons on October 29, nine were lost in the short war, further proving that the Mustang with its liquid-cooled engine and vulnerable radiator was not really suited to the ground attack role. Despite perceived obsolescence, the P-51s remained in service until the fall of 1958, with 116 Squadron being the last to operate Mustangs. The Monogram P-51D first appeared in the mid-1970s, and was - until the appearance of the Hasegawa P-51D in 1992 - the best 1/48 model of the Mustang available. Unfortunately, Monogram chose to open up the gun bay in the left wing, and to create a separate lower cowling panel, so that a modeler could display the model with the guns and part of the engine visible. Sadly, the gun bay door was molded flat, and the lower cowling panel was invariably short-shot, so that any modeler who wanted to build a model without these features was in for a lot of puttying, sanding down and re-scribing. 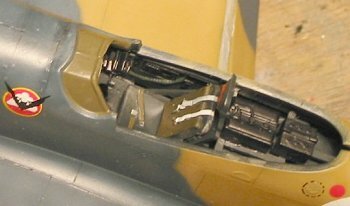 While the rest of the model was basically accurate, the kit came with fabric-covered elevators which were appropriate for the early P-51D-5 only; since the company produced their P-51B with incorrect metal elevators, it was an easy matter to “mix and match” since the parts were interchangeable. Cockpit detail was molded in to the fuselage sides, which looked all right so long as one did not want an accurate cockpit. The canopy, while thick, was the first P-51D canopy in any plastic kit to come close to the curves of the real thing. The kit has been re-released over the years, and is currently available for $10 retail, though one can find it at model swaps and on dealer’s tables at shows for considerably less. This particular kit arrived at Le Chateau du Chat at the end of August in a bag of Mustang parts given me by my friend David Garcia, for use in other Mustang projects. As I went through the bag, I suddenly came across a lower cowling part that was unlike any I had ever seen in over 15 years of building many examples of the kit: it wasn’t short-shot!! I went through the rest of the parts and discovered that one of the kits was what must have been a very early molding, due to the sharpness of detail in the individual parts. When I saw how closely the cowling part fitted to the fuselage halves when assembled, it occurred to me that this kit didn’t have to end up in the spare parts dungeon. 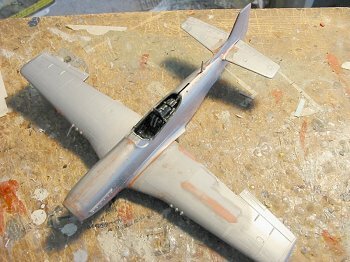 Thus, I ended up building the first Monogram P-51D I had done since 1991. For me, construction began with the fact that I wanted to drop the flaps. This meant taking out the razor saw and cutting the flaps away from the wing parts, as well as sawing off quite a bit of plastic from the fuselage halves in order to clean out the area under the wing fairing so an accurate flap could be positioned. I then assembled the flap parts, and added a piece of sprue to the leading edges, along with some plastic sheet to fill out the area that would go under the fairing. Putty was applied to the completed products, which were set aside to cure. I also glued the gun bay cover on and covered that with putty for later sanding down. I then turned to the cockpit. Many post-war Mustangs had their cockpits painted black. I wasn’t sure if the Israeli airplanes had, but there was no proof they hadn’t, and doing it in black with some aluminum dry-brushing to bring up detail would look good for doing the cockpit stock. I used Promodeler instrument panel decals, and replaced the kit seat with a better-looking Hasegawa Mustang seat from the spares box. The fuselage went together very tight, and with the better cowling part I found all I needed was some Mr. Surfacer 500 for seam filling, rather than the gobs of putty I had had to use on these kits before. With the putty on the wing cured, I used a couple of sanding sticks to sand it down smooth and match the full curvature of the rest of the wing surface. I sanded down the interior of the upper wing parts where the flaps would fit, then assembled the wing and glued it to the fuselage. Again, parts fit was excellent and I only had to use more Mr. Surfacer on the joint seams, even for the radiator intake mouth. I attached the horizontal stabilizers. Once everything had set up, I sanded the seams, and found I could keep much of the surface detail. I went over the raised panel lines with a #11 Xacto blade, doing a light scribing. The spinner on the Monogram kit is too short, so I replaced both the spinner and prop blades with Hasegawa parts from the parts box. This really improved the overall look of the model. 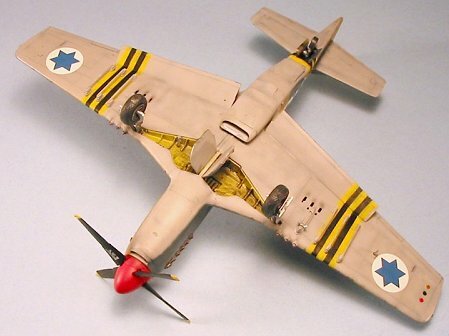 While I was doing this model, Dave Aungst published an Israeli Mustang project he had done over at HyperScale. I had the decals to do this from my IsraDecals sheet, so I mixed up the Israeli camouflage using Gunze-Sangyo paints, per Dave’s suggested mixes. After pre-shading the model, I masked off the black Operation Musketeer ID stripes, and painted the yellow stripes. When these were dry, the stripes were masked off and the rest of the camouflage scheme was painted free-hand, basing the pattern on the pattern Dave had done on his, with a few minor changes inasmuch as no two of these airplanes had exactly the same pattern. I used the IsraDecals for the national insignia and airplane number. I also applied a squadron badge, which later research showed was incorrect, and not needed since the 116 Squadron airplanes did not carry squadron insignias during the 1956 war. I used underwing rocket rails from a Hasegawa P-51D kit, without attaching rockets since those Hasegawa supplies are incorrect and I did not have other HVARs in the parts box. The bubble canopy is a Squadron vacuform canopy for the Monogram kit I had in the spares box. Since these airplanes were only painted in camouflage a few months before the outbreak of the war, I minimized weathering past having “sun faded” the paint on the upper surfaces, and applied some “dings” to areas that would be serviced. I used Tamiya Smoke for the exhaust and gunfire stains. The model was given two coats of thinned Dullcote at the end. I only wish Monogram had managed to pump out these kits with the lower cowling part finally molded right from the beginning. With that part produced right, the Monogram Mustang becomes a pretty easy kit to bring up to “contemporary” standards. It looks good sitting next to my Tamiya P-51Ds. I’ll bet sticking a True Details cockpit inside would really make it look sharp, and even with that and aftermarket decals, the entire project would still cost less than a Tamiya Mustang before purchase of any aftermarket items. Proof that just because it’s old doesn’t mean it can’t still look good.